Hi there. 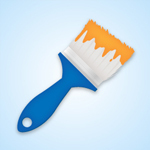 Here you can learn to create a quite simple paintbrush icon. For this fast tutorial you’ll use some basic tools like the Rectangle Tool, the Ellipse Tool or the Pen Tool. Then, for some neat effects you’ll need the Wrinkle Tool or the Warp and Rougher effects. Create a 256 by 256 px document. First, select the Ellipse Tool(L), create a squeezed shape (as shown in image #1), add the Fish effect (Effects > Warp > Fish) then go to Object > Expand Appearance. 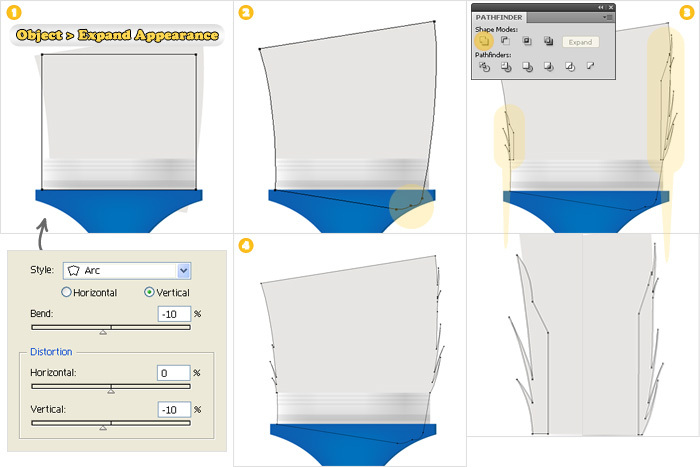 Next, select the Rectangle Tool, create a new shape and place it as shown in image #2. Add the Bulge effect then once again go to Object > Expand Appearance. Reselect the Rectangle Tool(M), create a thin shape and place it as shown in iamge #3. Do not leave any space between this new shape and the other. Now, select all three shapes, click on the Horizontal Align Center button (from the Align pallete) then on the Unite button (from the Pathfinder pallete). Name the resulting shape “Handle” and fill it with R=0 G=113 B=188. Next, you need to make a little hole in the handle. Select the Ellipse Tool(L), create a small circle and place it as shown in image #1. Select this circle and “Handle” and click on the Minus Front button from the Pathfinder panel. Rename the resulting shape “Handle”, make sure it’s filled with R=0 G=113 B=188 then add the Inner Glow shown in image #2. Make to copies of “Handle” (Ctrl+C > Ctrl+V). Select the top copy and move it a few pixels to the left. Next, select both copies and click on the Minus Front button from the Pathfidner pallete. Fill the resulting shapes with R=8 G=87 B=145 and erase the Inner Glow effect. Let’s continue with the head of the paint brush. First, select the Rectangle Tool(M) and create a shape like the one shown in image #1. Name it “Hair” and fill it with the color shown in image #1. Create a copy of “Hair”, name it “Steel”, resize it as shown in image #2 and fill it with R=237 G=237 B=237. Add three new fills for this shape (from the flyout menu of the Apeearance pallete) and use the gradients shown in images #3, #4 and #5. 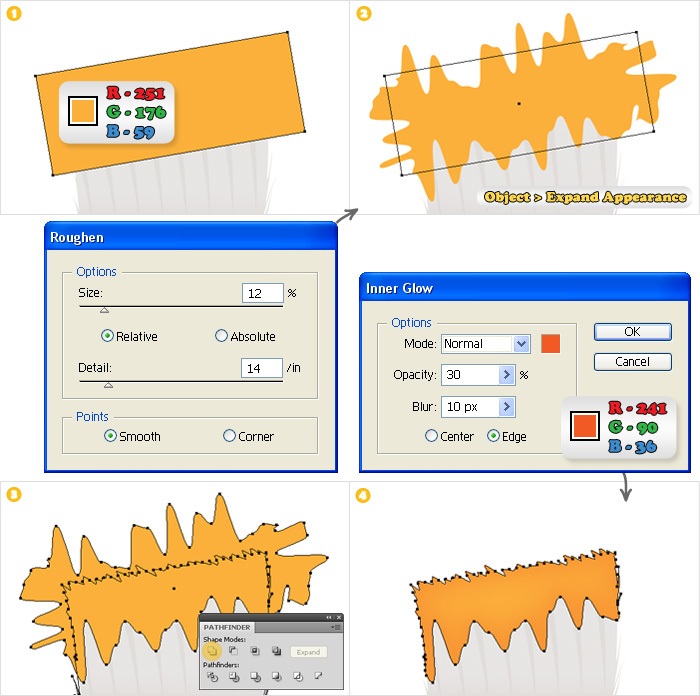 Reselect the Rectangle Tool(M) and create four new shapes as shown in picture #6. Change the blending mode of these shapes to Multiply and fill them all with R=244 G=244 B=244. Return to the “Hair” shape, add the Arc effect (Effect > Warp > Arc) then go to Object > Expand Appearance. Add two anchor points near the bottom right anchor point (with the Add Anchor Point Tool). Next, hide the bottom right anchor point behind “Handle”. 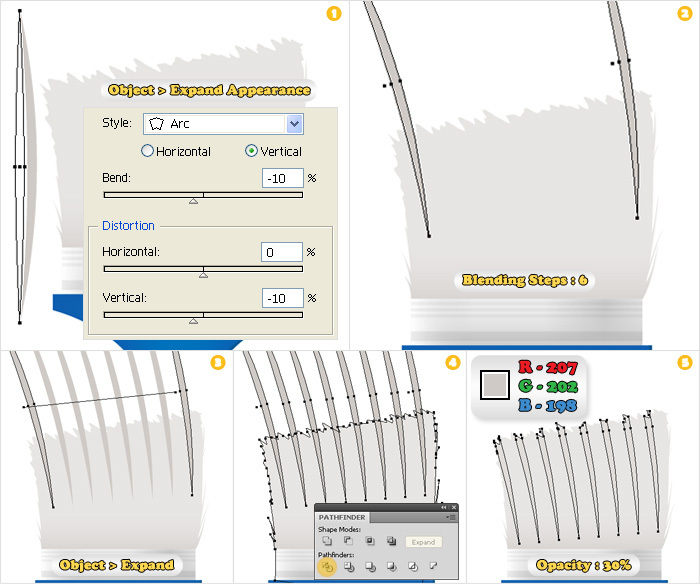 Now, select the Pen Tool(P) and create two shapes approximately like those shown in image #3. Select them along with “Hair” and click on the Unite button from the Pathfinder pallete. Name this new shape “Hair” and make sure it’s still filled with R=231 G=229 B=227. 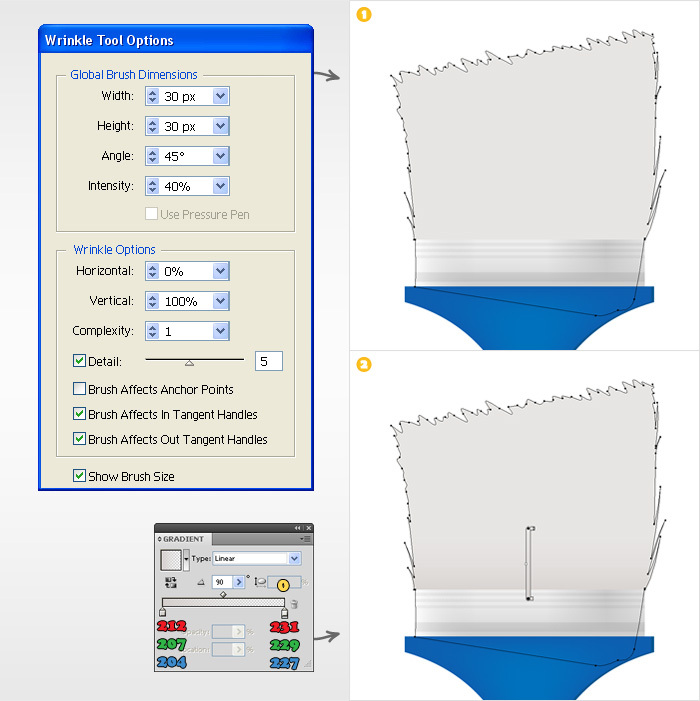 Double click on the Wrinkle Tool and enter the data shown in the following image. Next, select “Hair” and use the Wrinkle Tool to obtain an effect like the one shown in image #2. Add a new fill for “Hair” and use the gradient shown near image #2. Select the Ellipse Tool(L), create a squeezed shapes (image #1), add the Arc effect (Effect > Warp > Arc) then go to Object > Expand Appearance. 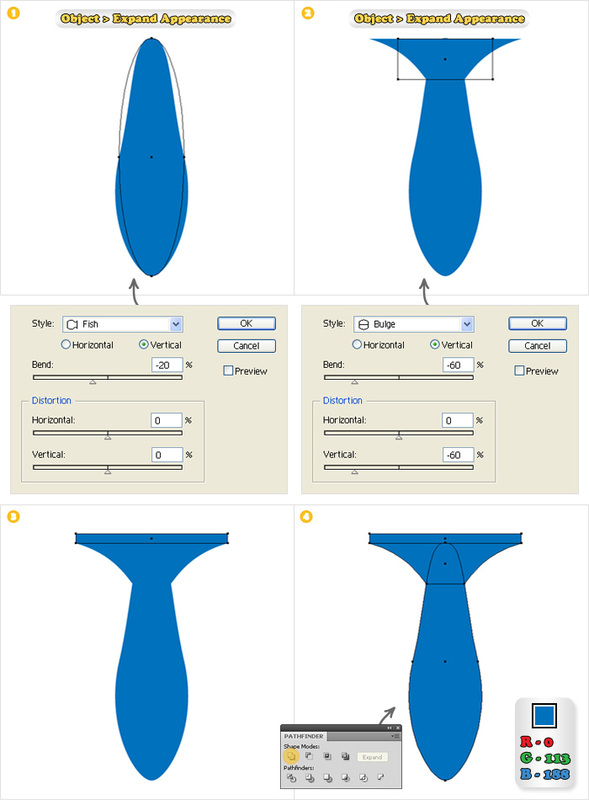 Create a copy of the resulting shape. 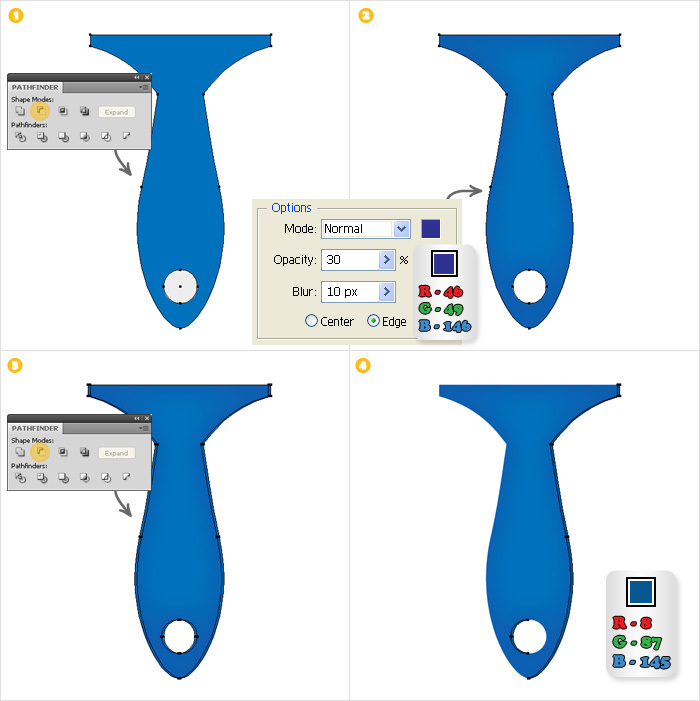 Place these two shapes as shown in image #2, select them then go to Object > Blend > Make. Select this new blend and double click on the Blend Tool(W) or go to Object > Blend > Blend Options. 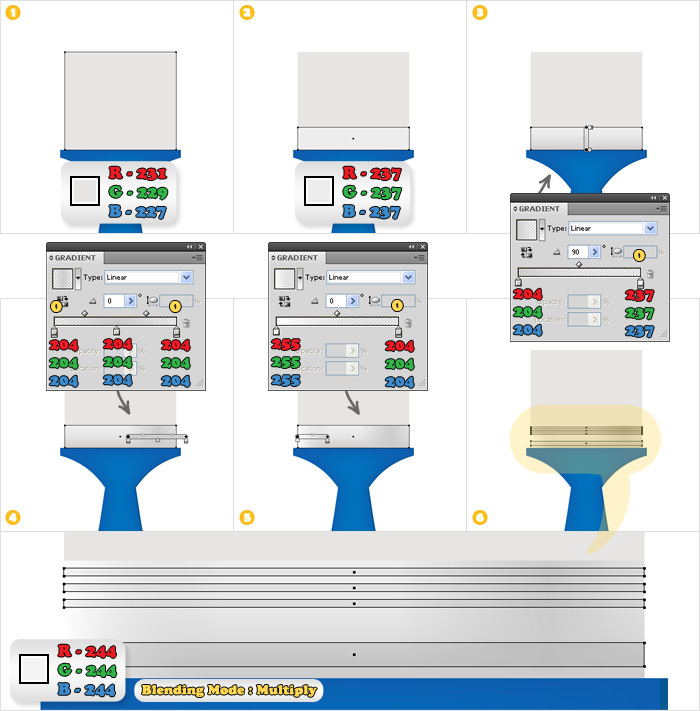 Pick Specified Steps (from the drop down menu) and enter 6 (now your blend should look like the one in image #3). Create a copy of “Hair”. Reselect the blend and go to Object > Expand. Next, select the resulting group and the copy of “Hair” and click on the Divide button from the Pathfinder panel. Keep the shapes shown in image #5 and delete the rest. Lower the opacity of these shapes to 30% and fill them with R=207 G=202 B=198. Create a new copy of “Hair”. Pick the Rectangle Tool(M), create a new shape, rotate it (as shown in image #1) and fill it with R=251 G=176 B=59. Reselect this shape, add the Roughen effect then go to Object > Expand Appearance. Select the resulting shape and the copy of “Hair” and click on Intersect button from the Pathfinder pallete. Finally select this new shape and add the Inner Glow shown above image #4.
look so good.i will practicse it. Great tutorial and the use of the effects to create shapes was a cool tip. I think there is a little mistake.. in Step 3, image #4, there is a gradient made up of 3 colors, in the middle it’s darker, and at the edges brighter, well this doesn’t work if all colors will be set as in the image.. (204, 204, 204) it worked with (237, 204, 237)..
It’s the same color. But you need to select the left and right gradient sliders and lower the opacity to 0% (take a closer look at the images and you’ll see a yellow “0″ above the gradient sliders). 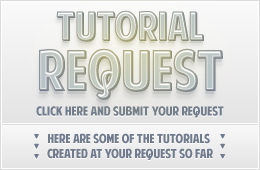 You need Illustrator CS4 or higher to perform this step. I like your tutorial, it’s clear and simple. Thanks for sharing!